Why Is Marketing Ops So Vital For Sales and the C-suite? Today’s dynamic and demanding marketplace is forcing marketing teams to evolve, get organized, and be run like a business. In response, marketing leaders continue to mature their marketing operations function, extending its influence into every part of the organization – marketing, sales, finance, and executive management. The vision for a marketing operations function is to improve the efficiency and effectiveness of marketing across people, processes, technologies, and data to achieve desired business outcomes. Marketing Operations should serve as a core function for marketing, providing cross-functional coordination, communications, and reporting. Your marketing ops team will be instrumental in successfully transforming marketing into a revenue and growth engine for your company. As this change occurs, benefits accrue to you, the CMO, the sales organization, and the executive team. Run marketing like a business, delivering the ‘right’ programs on-time with high quality. Achieving financial objectives, delivering strong ROI through optimized budget and resource use. Earn a seat at the table, delivering strategic market and industry insights to the executive team, and enabling sales to be more productive sellers. Typically, a high performing marketing ops team possesses critical skills necessary for marketing, balancing program coordination and data-centric competencies with technology acumen. The team will help coordinate strategy and planning activities, lead campaign and program management, and prepare performance reporting and analytics. 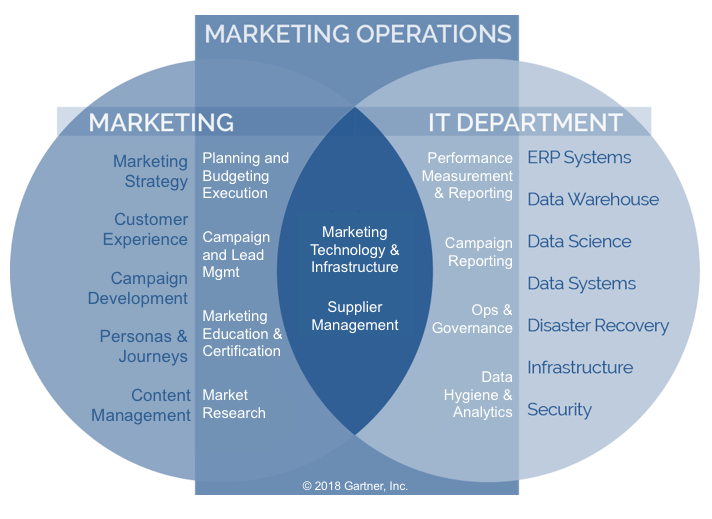 The melding of technology, data, marketing and analytics by marketing ops enables you and the rest of marketing management to gain an understanding of how marketing efforts are impacting the pipeline, brand, customer acquisition/retention rates, and revenue. Marketing Ops enables you to run marketing like a business with profit-and-loss (P&L) statements, reliable revenue and growth projections, ROI analysis, and more. Align the entire go-to-market team, providing a foundation for planning, collaboration, and communication between marketing, sales, and the products team. Consistently drive revenue and quota attainment, by assigning marketing budget and resources to the most effective marketing programs. Improve competitiveness, by enlightening the sales and executive teams with the latest competitive and industry market research. Increase agility, by improving the way in which marketing responds to the digital economy and customer need. It’s no secret that marketing, sales, and the executive team have a checkered history. For too long, sales and marketing lived and worked separately with their own languages, own priorities, and own view of success; while marketing struggled to answer key business questions raised by the executive team. Marketing Ops will help eliminate these typical political and functional issues, ultimately improving communication, driving alignment, and building a long lasting synergistic relationship with sales, finance, and the rest of the executive team. Marketing Ops is sitting on top of a world of customer data that can be mined and analyzed to produce key customer insights for better decision-making and more effective selling. No executive likes to make key business decisions without data; and, while gut instinct may work in some cases, given the speed of business today, real-time data is needed. This is the ultimate role of the marketing ops, and it is possibly where they will have the biggest impact on the future of the business. Do you have a marketing ops team? If so, what is their level of influence, scope, and effectiveness? If you are just getting started or looking to optimize your team, check out “Responsibilities of Marketing Operations” (Gartner subscription required) and “Ask Seven Questions to Optimize Marketing Operations Costs” (Gartner subscription required).